Baina beach is a large crescent shaped beach located close to the city of Vasco. The beach is calm and safe for swimming. It lies about 1 km. from the city. Baina beach is bounded by hills on both sides of the beach. On its right is the Zuari nagar hill which is now fast developing into a residential area for factory workers. To the left side of Baina beach lies Dabolim plateau atop which is based the Dabolim airport. cleared the prostitutes and brothels from the red light area. Prostitution is still prevalent here, although currently things are much better and the beach much cleaner. The portion away from the beach entrance to its right has some slums and is usually littered in thrash. The left portion of the beach is much cleaner. Just a kilometer away from the beach in the sea lies bat island. The island can be seen from the beach itself rising from the sea. This used to be a favorite getaway destination for tourists. Recently the navy has seized control of the island and access to it is restricted. 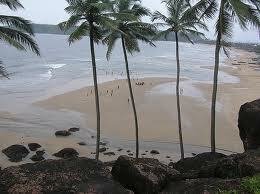 Baina beach can be reached from Vasco city by bus easily.